In Barbara Henning’s Cities and Memory the quotidian choreography of a day is teeming with experiential data meshing the feelings of place, people and time. She strips away static silhouettes shadowing the backdrop of time composure and stillness are shattered as continuous reality is layered in this subtle and sustained work. As if a direct challenge to a possible outcome detailed by Michel de Certeau in The Practice of Everyday Life, “Immobile inside the train, seeing immobile things slip by. What is happening? Nothing is moving inside or outside the train.” Cities and Memory risks itself by opening up to the flood of continuum streams. These registers are edged with compassion—Brenda Iijima. 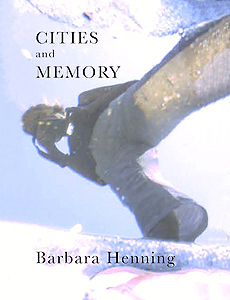 Barbara Henning’s new book from Chax Press, Cities and Memory, is a tremendous accomplishment. Across a range of varied projects in prose, the consistent element here is the sentence as a unit of perception used to annotate a life, or to sketch the shadows of one’s experience before they shift again. Henning’s way of playing with sentences, at times splicing together different observations from different situations, has a density and substantiveness, can feel meditative and frenetic at the same time, the way a walk through a park in the city might, the city where “Even during deepest sleep, I think I am always aware that I am almost never, except in the early morning, alone.” The city which is nevertheless, like memory, “a place where it’s not so easy to be local.” One underlying principle turns out to be an oscillation between what Stanley Cavell would call inhabitation and abandonment, raising the question of whether one can indeed live in one’s utterance or whether one is constantly being evicted from it, even by choice. Tenney Nathanson in describing this work refers to the “lightly-worn gravitas and grandeur inhabiting even the most conspicuous occurrence.” I’d heartily agree with that, and add that what I may admire most here is the amazing honesty of the details and Henning’s ability to also include all the weirdness and discomfort that we have trouble speaking about otherwise, the strangeness of all the types of encounters in the city for which we have no sufficient public language. While on the one hand the writing’s restraint is admirable, especially the way it avoids bad pathos of the self-help variety, the work nevertheless has a compelling richness and intensity that seems to call for both close listening and for active transference from the reader. Henning’s language opens up the itinerant experience of writing to declare, at the site of the sentence, “Today I like not having too many things.” And I believe her. Please welcome Barbara Henning to the EOAGH Reading Series today. Tim Peterson’s introduction at Unnameable Bookstore reading in March 2010.